Shortly thereafter, the first “If you lived here, you’d be home!” sign appeared. 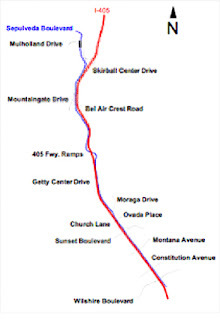 In 2001, the LADOT funded an $11 million “Sepulveda Reversible Lane” project through the MTA’s Call for Projects. The plan called for a 3.5 mile-long reversible lane down the center of Sepulveda Boulevard. The plan met with huge opposition from both cyclists and residents. 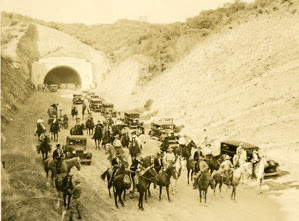 Nobody disputes that the Sepulveda Pass is congested or that it is overwhelmingly directional. Up to nine times more vehicles travel in one direction at rush hour compared to the opposite direction. At issue was the residents’ claim that an increase in capacity would immediately fill to the same level of gridlock by attracting traffic from the 405. Cyclists argued that the increase in capacity would come at the expense of their safety. “This plan will actually induce traffic, cause even more congestion and make it virtually impossible for residents in the area to get in and out of their homes,” said Brentwood resident Patricia Bell Hearst. “The Department of Transportation is putting bicyclists in grave danger by not including a bicycle lane on the southbound side of Sepulveda,” said Aaron Kirsch, a member of the L.A. County Bicycle Coalition. Ultimately, the project died when City Councilmember Jack Weiss listened to concerns from the stakeholders of the area and then declared his opposition to the project. Weiss voiced his concern that the project would increase hazards without significant improvement in travel time and then requested that all work on the Sepulveda Reversible Lane project stop. Listed as “No Impact” on the Environmental Review Document is the fact that the existing southbound bike lane between the tunnel and Skirball Center Drive would be removed to accommodate a new third southbound traffic lane. Alleviating peak hour congestion, reducing travel delays, and enhancing safety for recreational and commuter are admirable goals but this project is not the solution. The funding for the Sepulveda Boulevard improvements is contingent on a “reversible lane” element. Selecting the tunnel as the location for the minimal implementation of the “reversible lane” requirement without providing any accommodations for cyclists is dangerous. 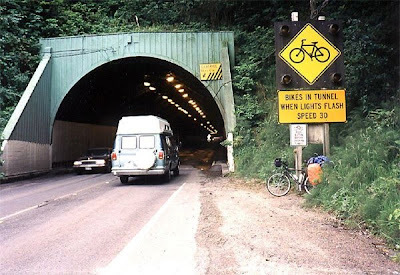 At the least, signage and a demand actuated “cyclist in tunnel” warning system would provide some safety support for cyclists in a high conflict area. Anything less is unacceptable. The City of Los Angeles Transportation Plan designated Sepulveda Boulevard as a Class II Bikeway. Any roadway improvements to this boulevard that do not bring the boulevard up to standard are unacceptable. The project calls for a Class III Bikeway on the southbound side of Sepulveda which is at odds with the City’s route selection criteria which states that routes should NOT be designated on streets carrying traffic volumes of over 10,000 vehicles daily or with curb lane volumes of over 150 vehicles/hour. Swapping out a Class II Bike Lane for a Class III Bike Route is pure sleight-of-hand and it is unacceptable. Bike Lanes come in pairs. A Bike Lane on one side only encourages wrong way travel. This is also in violation of the LADOT Bikeways standard. Placing a northbound bike lane between Bel Air Crest and Skirball without a southbound bike lane is unacceptable. Roadway improvements should be…improvements. Removing a bike lane to accommodate a new third southbound traffic lane is not an improvement and it is unacceptable. While the logic of not placing restrictive bike lanes on a downhill is established in the MUTCD, expecting cyclists to merge with speeding traffic is simply cavalier and irresponsible. Two cyclists died on PCH last year when they were forced to merge into 50 mph traffic. Unless there are guarantees that vehicular traffic speeds will be restricted on the downhill, this plan is pure folly and it is unacceptable. The City of Los Angeles claims that the “Sepulveda Boulevard Reversible Lane, Bike Lane & Intersection Improvement Project” will alleviate peak hour congestion (ie. increase capacity), reduce travel delays (ie. speed up traffic), and enhance safety for recreational and commuter bicyclists (all this while removing a bike lane, creating an inconsistent environment and leaving cyclists to fend for themselves in the tunnel without so much as a shoe-horn for assistance or protection.) The LADOT’s plan communicates loudly the place of cyclists on the transportation food chain. The Environmental Document is available for a 30-day public review and comment period beginning on Friday, February 16, 2007 and ending on Monday, March 19, 2007. Hey, nice blog. Thanks for helping to make LA an even more awesome place to ride. I like the historical photographs. Can I join in the quest for 4705km? The Year Of The Cyclist! City Council And Mayor Recognize BikeWinter!